Discussion in '1940' started by Drew5233, May 5, 2011. Taken from the link below and identified by May 1940 (Andrew) and Rich Payne and the rest of the 1940 gang. BEF Vehicle Markings Thread Post Number 6. Now that vehicle units are being successfully identified I thought I'd pull any pictures out of the above thread that can have further information added to them from the war diaries I already have. Whilst the Thornycroft below has been identified as having the 2nd Searchlight Regiment formation sign its not possible to identify what battery it belonged to so I have attached all of the likely entries available for the units war diaries. BEF Vehicle Markings Thread Post Number 9. Either of the two battery pages posted could fit in with this vehicle. My Grandfather was a driver/mechanic in the 2nd Searchlight Regiment Royal Artillery. On 19 May 1940 his regiment were driving through French Countryside when they were bombed and ambushed by the German's with machine guns. I would be very interested in hearing from anyone who has more information regarding this incident. Many thanks in advance. My grandfather was a Gunner in 6 Battery, 2nd Searchlight Regiment. He was captured around the same time, 20th May 1940 at Abbeville and later at St Omer 10 days later. Do you have any more information? What battery was he in? My Grandmother's childhood friend was in the 2nd Searchlight Regiment Royal Artillery. He was killed circa 19th May 1940, presumably in the incident you have detailed below. I visited his grave a few weeks ago and have photos of the other graves if you are interested. A copy of his service records may help as he may not have been with 8 Battery. Their war diary as them near St. Omer on the 22nd May 1940. 8 Bty., 2 Searchlight Regt. Son of Richard Grimshaw Holt and Christina Holt; husband of Dulcie Holt, of Farnborough, Hampshire. A search of this cemetery for May 1940 (Results) shows a variety of dates, units and services (all 3 in fact) so was it possible this cemetery was near to a hospital at that time?? 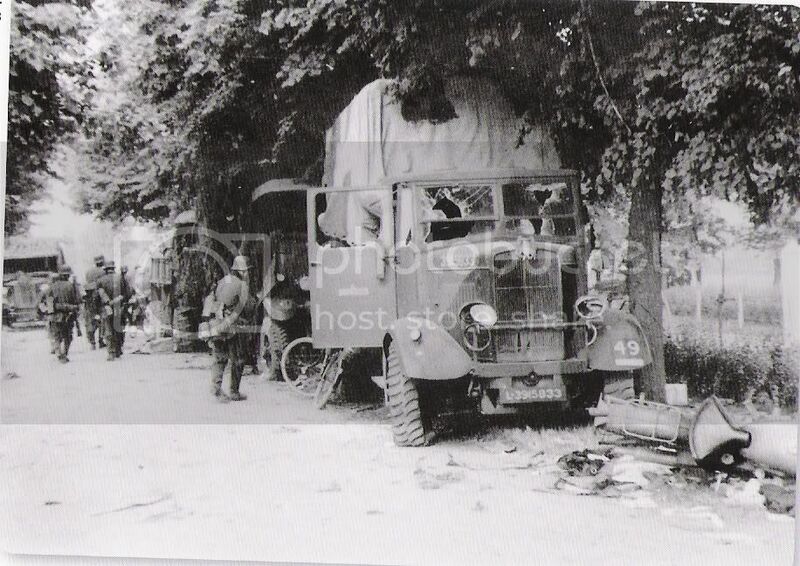 After doing a lot of digging and research I believe that the Thornycroft truck in the photo most likely belonged to 6 Btty or 8 Btty. In the diary for 8 Btty they are located with parts of 6 Btty at a location given as Moeres at a grid reference H 413835 which is a location approx. 3 km south of De Panne. The photograph below is a Google image for that location and clearly shows a very similar location. This was the last location for the unit and what remained of them were ordered at 15 mins notice to Dunkirk for evacuation. Good morning very interesting post. My uncle served with the 2nd searchlight regiment royal artillery before he was captured at Dunkirk and transported to 2 pow camps where he sadly pereished on his voyage home with a pint of his own blood. I get so confused with regiments and battery’s he was a gunner. Hello, Thank you for your response. Sadly I do not know anything else as my Grandfather is now deceased. Hello Trevor, As yet I have no more information. I do know that my Grandfather did not return to England until 1943 as he was a POW until 1943. Thank you. This is my Grandfather in his uniform. I still do not know which battery he was in. How would I find that out please? This is my Grandfather's account of what happened to him and his comrades on the 19th May 1940 when they were attacked by The Germans. Great to see something so closely related to 2nd Searchlight Regiment and the day my grandfather was captured. In terms of finding the specific battery, there are 4 to pick from - 5, 6, 7 and 8. My own conclusion was quite fortunate in that I knew my grandfater’s commanding officer, and these officers were noted down in each battery diary. Do you know anybody of rank that your grandfather served with? Saving that, if there are any particular dates/locations during those first months in France, that may be able to be attributed to a particular battery location.